THE EDITOR: I had some great help on this book from Antoine Valot, Shaunn Grulkowski, and Amanda Hardebeck, and they all deserve credit. 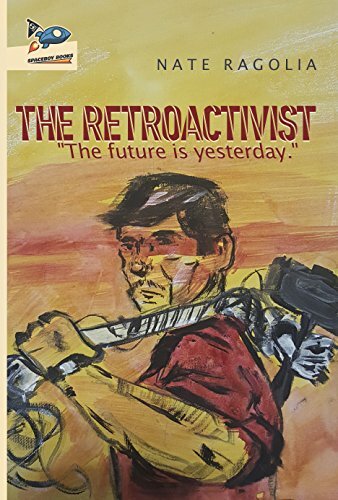 SUMMARY: The Retroactivist is the story of Reid Rosales, an aspiring cartoonist living in Capitol Hill Citizenry District, Denver, Colorado, United Sociocracy of the Americas in 2087. Technology and automation have removed human beings from jobs and work, allowing the economy to thrive on the backs of robots. In exchange for daily hyper-local voting, everyone receives a basic income that allows them to live comfortably and pursue whatever travels, hobbies, desires they wish. After running out of creative inspiration, Reid begins a search for meaning and seeks some way to differentiate himself from all the other citizens who work in cartooning. His search brings him to the doorstep of a 20th Century reenactment society called Club 20c, wherein the members participate in bygone capitalism, class systems, and war games. Eventually, Reid’s passion for the club leads him to incite a revolution against the Sociocracy with consequences that change his life, and the lives of his friends, forever. THE BACK STORY: I wanted to write a novel that aped the standard plot line found in many popular dystopian science fiction books, like 1984, Brave New World, The Hunger Games series, etc. while involving a world that was pretty clearly established as a utopia. Part of it, for me, was a belief in self-fulfilling prophecy. If we keep reading stories about how terrible and fascist the world MUST become in the future, we might actually manifest it… or at least accept it as it degrades because it feeds into a sequence of narratives we’ve already observed and consumed. The other part was to write something that satirized present day society through the lens of the future. (I’m a big fan of classic The Twilight Zone and the optimistic science fiction of Star Trek.) Most of the systems that are in place today, for their flaws and the ways they are unfairly manipulated, are entirely human-made, which means they’re also all very changeable. This book is about anti-heroism, and about seeing the future for its potential, rather than for its potential pitfalls. WHY THIS TITLE? : Reid’s revolution is an activism of regression… so The Retroactivist seemed like a witty way to convey that idea. WHY WOULD SOMEONE WANT TO READ IT? This book is a utopia/dystopia sci-fi novel that’s inherently optimistic and interpersonal. It’s about what good could come from humanity in the future. It’s also about relationships and personal meaning, and exploring how completely loving we can be of each other if we found a way to remove the senses of scarcity and fear that pervade modern life. If you like stories about rugged individuals saving the world from government, if you’re looking for something new in science fiction, or if you see the future as a bright potential then this book is for you. 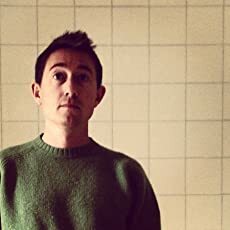 AUTHOR PROFILE: Nate Ragolia grew up in rural Colorado reading science fiction and comics, and imagining strange worlds beyond our own. He was labeled as “weird” by a girl in his first grade class and it stuck. These days, he’s a writer and publisher in Denver. He’s authored the books, There You Feel Free, and The Retroactivist, co-founded Spaceboy Books LLC (readspaceboy.com), and edits BONED: A collection of skeletal writings (bonedstories.wordpress.com). He also dabbles in webcomics, The Illiterate Badger (2009 – 2016, illiteratebadger.com) and The Right Corking Adventures of Cecil Larkbunting and Alastair Wakerobin (2013 – present, larkandrobin.com). When not creating, he’s spending time with his wife, petting his dogs, and voraciously devouring other peoples’ works. AUTHOR COMMENTS: In addition to the points about dystopia and social commentary alluded to above, this book is about our potential for true individual freedom (from illness, poverty, suffering) that could come from working together to change how our society operates, whether by technology or other means. LOCAL OUTLETS: Any store can special order it at your request. WHERE ELSE TO BUY IT: Amazon, Barnes & Noble, Indiebound.org, or request it at your local bookstore. CONTACT THE AUTHOR: You can find me on Facebook at @NateRagoliaAuthor and on Twitter at @nateragolia. Reach out. Every book is part of a greater dialogue.